There is plenty of data out there, and much of it is boring. The interestingness of the data you collect is one of the key factors by which your work will be evaluated. You are going to ask the world a question, and the world will cough up some data in response. Often a small change in the way you pose a question will produce very different results. (Per Ben Fry’s formulation) Upon completion of this assignment, you will be able to acquire, and potentially parse and filter, data using a powerful meta-API for web scraping. Students will be able to use data scraping techniques to support inquiry-driven and curiosity-driven investigations of the world. The Guerilla Open Access Manifesto by Aaron Swartz. Also please read about Swartz’s activism related to PACER and JSTOR. Another challenging example was that of the hacker Weev, who faced 5 years in jail for scraping improperly secured personal email addresses from AT&T. (He was eventually acquitted after much legal trouble.) To avoid this sort of situation in our class, we will establish the policy that you may not scrape personal data (e.g. contact, personal or financial data about customers, credit card information, etc.) for anyone other than yourself. Create an account on Temboo.com, immediately. Complete this survey to give the professor the email address associated with your Temboo account so that it can be blessed with special powers. 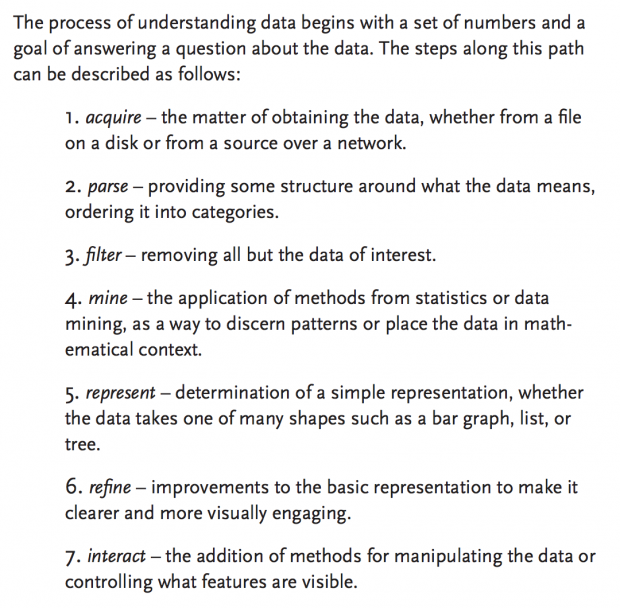 Read the Taxonomy of Data Science tasks, by Hilary Mason and Chris Wiggins, with special attention to their sections on obtain and scrub. Read the Guerilla Open Access Manifesto by Aaron Swartz. Read Art and the API by Jer Thorp. Identify an interesting online website, public data API, or database that manifests in scrape-able HTML. This can be anything you wish — for example, you might fetch public civic data Or you might fetch something weird and funny, such as the real names of hip-hop artists. Create a scraper to automate the extraction and downloading of this data. Scrape some data. Our target is something on the order of 1000 or more records, preferably ~10,000: more than you could conveniently copy-paste by hand, and more than you could visualize without some sort of computational approach. Please: don’t forget to put in a couple seconds’ delay between queries — otherwise, you may get banned from some network or service. In a blog post, discuss your project in 100-200 words. What did you learn? What challenges did you overcome? In the blog post, present a sample of some of the data you collected. The format of this is up to you. Present enough records (50?) that one can get a feel for what you’ve collected. Draw a rough sketch of how you might later visualize this data; in include a scan or photo of the sketch in your blog. Link to the Github repository that contains all of your code for this project. Be sure not to post your private API keys in your Github code. Categorize your blog post with the category, 12-datascraping.